After running the U.B.C. 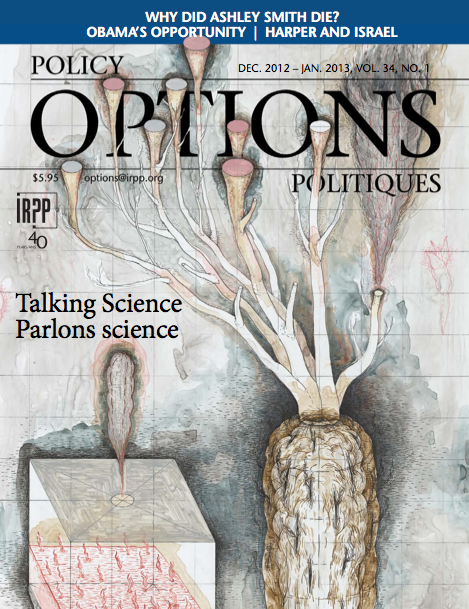 Videomaking Workshop last September I was asked to write an essay for the Canadian magazine Options Politique. In it, I talk about the importance of storytelling to the Obama election (one small story in a TV commercial may have been the deciding factor) and how politicians live and breathe the importance of trust and likeability, while environmentalists and scientists still just don’t quite get it. Wanna hear me parlons some science? Here’s an article I just wrote on the subject. So I assume you know of the distinguished journal Options Politiques. Yes? You do? Cool, then can you tell me about it? Sorry. That’s terrible. I just really had never heard of it when they asked me to write this essay last month, but they did a nice job of pulling what I wrote together with a cool layout. No need for a bunch of background on this one. It’s about trust and likeability. And not much more. Wanna know how to win over the American public on climate change? Create a voice that they trust AND like. That hasn’t happened yet. Here’s what I have to say on the subject in detail.